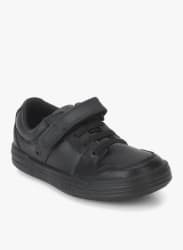 Help your young lad step-out in style with these black sneakers by Clarks. Featuring synthetic upper and rubber sole, these sneakers are durable and lend him boosted grip confidence across various surfaces. The synthetic lining of these sneakers keep his feet stink-free and go with any casual attire. Shoe Care Wipe surface with a dry and clean cloth to remove dust.